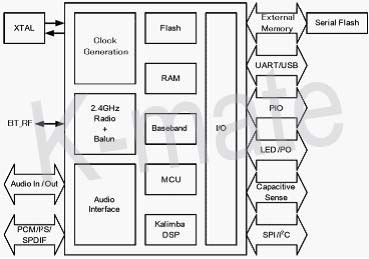 The KMBT002 consumer audio platform for wired and wireless applications integrates an ultra-low power DSP and application processor with embedded flash memory, a high-performance stereo codec, a power management subsystem, LED and LCD drivers and capacitive touch sensor inputs in a SOC IC. 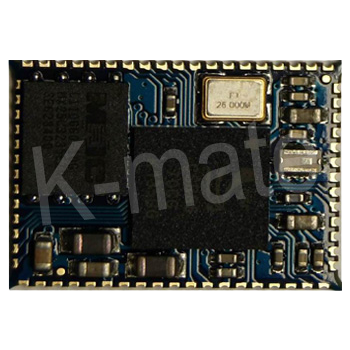 The dual-core architecture with flash memory enables manufacturers to easily differentiate their products with new features without extending development cycles.K-mate popular KMBT002 platform is software-portable to the KMBT002, with easy migration of a broad range of solutions from CSR’s eXtension partners. This migration enables rapid time-to-market deployment of a broad range of consumer electronics products. The enhanced Kalimba DSP coprocessor with 80MIPS supports enhanced audio and DSP applications.